Hi all, recorded with fraps, I could probably configue it better. 1:Controller input seems a bit glitchy, making combos hard to execute at times. 2:Video slows down alot, see the fight with marduk. This happens also when not recording. 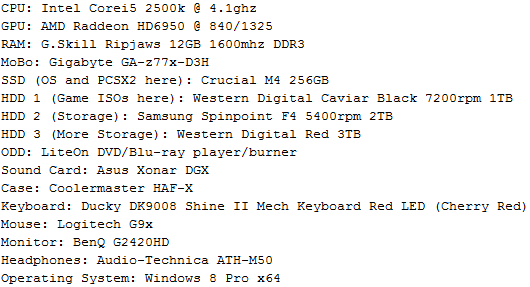 This machine is not overclocked in anyway, everything is factory settings. Super joybox pro with lilys controller plugin. Did you try speedhacks ? Yes, messed around with some speed hacks, I found the default ones worked best. Overclock to 4.0 GHz may speed up things a bit. Sadly, PCSX2 doesn't use more than four CPU cores. (01-19-2013, 07:28 PM)phrase Wrote: Overclock to 4.0 GHz may speed up things a bit. Sadly, PCSX2 doesn't use more than four CPU cores. Out of interest what rev. are you using? And what resolution? 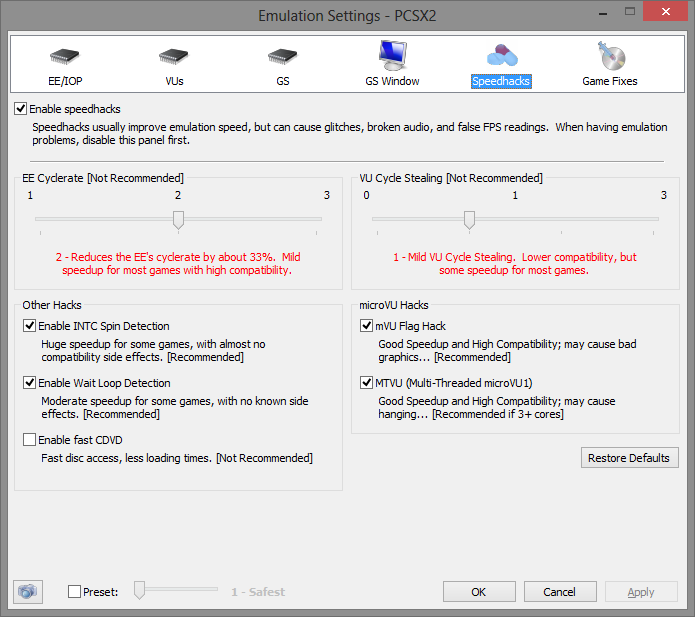 Its rev PCSX2 r5517, software rendering mode so no res option, I set extra rendering threads to 12. (01-19-2013, 09:48 PM)lionhart_3001 Wrote: Its rev PCSX2 r5517, software rendering mode so no res option, I set extra rendering threads to 12. Why are you using software rendering? There is absolutely no need whatsoever for you to have software mode enabled for this game with your PC's specs. You should be using GSdx with DirectX 11 in hardware mode at or higher than 4x native resolution. You should not be getting any lag at all. This is what your speedhacks section should look like: http://i.imgur.com/DWexzsM.png - EE Cyclerate being left at 1 and VU Cycle Stealing being left at 0 if you experience any problems (your PC is better than mine is and I don't get any lag at all with GSdx set at 6x native resolution with those speedhacks). If it helps, I am running Tekken 5 with no slowdowns with a 3930k running at 4.2GHz. All speedhacks are disabled in favour of accuracy, and software mode with 8 rendering threads is used. Seeing how the 3930k is already rated to run at 3.8GHz properly, extracting another 400MHz should not be too difficult. In fact you may not even need that much speed - I haven't tried running Tekken 5 at other clocks, but I do know that it slows down on the default 3.2GHz setting. Also, I have found that, at least with Tekken 5, hardware mode actually runs noticeably *slower* - even at native resolution. I do not know why. After doing some testing it appears I was mistaken. Tekken 5 unfortunately appears to be one of those games that doesn't work very well on PCSX2. Not only do you have to run it at a specific resolution (1020x1020 in my case) to remove vertical black lines but even though I was running it at full speed in both hardware and software mode I still got weird slowdowns while fighting.